History of Nova Scotia; Book.2; Part 5; Ch. 11. "The Shannon and the Chesapeake," Part 1." Ch. 11 - The Shannon and the Chesapeake, Part 1. Through the winter of 1812/1813 the admirals at London had to reflect on their very poor performance in the naval battles that they had had with the young United States. The British admiralty was confounded by the British lack of success in American waters. The failure of their ships was not something the Admiralty Lords had experienced for many years. Enter Philip Bowes Vere Broke and his 38-gun Shannon. 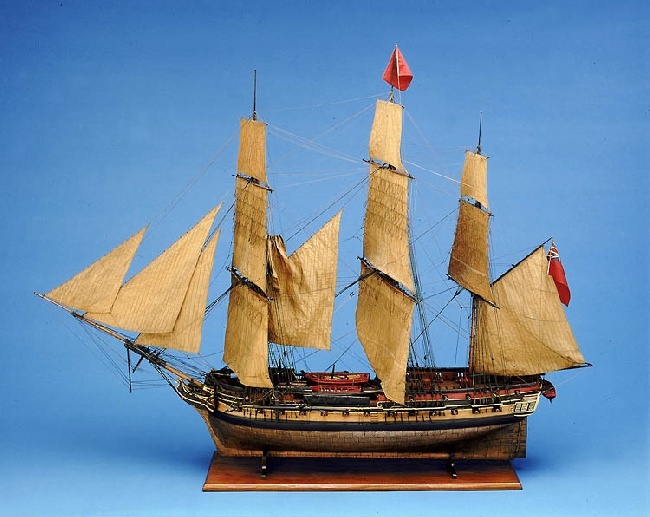 A Model of the 38-Gun Frigate, HMS Shannon. 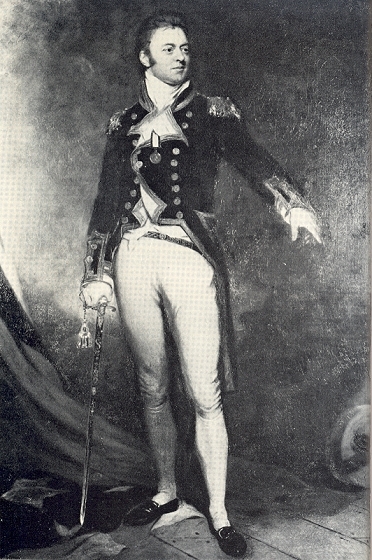 When Admiral Sir John Warren, who came to command the North Atlantic fleet, left for his winter digs at Bermuda, he left "Captain Broke in command of the squadrons on the coasts of Nova Scotia, New Brunswick and New England.8 In December he escorted a homebound convoy half way across the Atlantic and returned round the Azores. "9 That spring, 1813, the Shannon and her well-disciplined and experienced crew, both at the guns and at the sails, were patrolling off Boston. It was known that the best ships of the young American navy were holed up in Boston Harbour. The USS Chesapeake, which was then refitting in Boston, came out, her captain interested in single ship combat. The Shannon had sent her traveling companion, the 38-gun HMS Tenedos, away, over the horizon. "The two ships met at half past five in the afternoon 20 miles east of Boston lighthouse between Cape Ann and Cape Cod. Shannon was flying a rusty blue ensign at the peak and her outside appearance suggested that she would be an easy opponent. 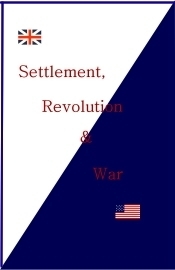 "10 Little did the men of the Chesapeake know of Captain Broke and his crew. Philip Bowes Vere Broke was from "an old English family." The family seat was Broke Hall near Harwich. Born in 1776, he was the eldest son of Philip Bowes Broke. After some preparatory school work, Broke, as a young gentleman13 was sent off to the Royal Naval Academy at Portsmouth in 1788. We add, parenthetically, that while Broke came from a well-connected family, his course of promotion, like most all royal naval officers, would rely on the ability that he demonstrated as an officer aboard a British warship. This was less the case in the army. As for Philip, in 1792, he joined the British sloop, Bulldog as a midshipman. In 1797, at just 21-years old, Broke participated in The Battle of Cape St. Vincent as an officer aboard the 32-gun Southamton16 At the age of 25, Broke received his first command of a naval sloop. At age twenty-nine, he received his first significant command when he was appointed to the 32-gun Druid. From the Druid, in 1806, as has already been mentioned, Broke took command of the 38-gun Shannon. 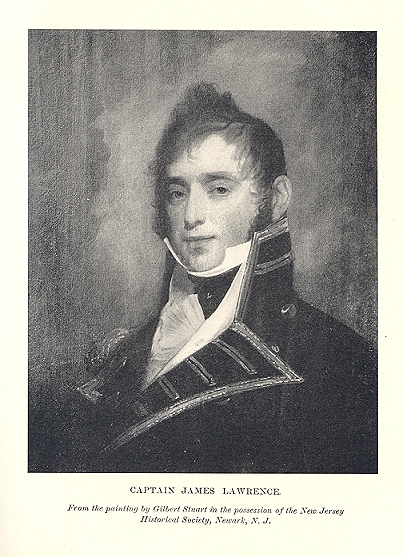 The newly appointed captain of the Chesapeake was James Lawrence whom we have briefly referred to in an earlier chapter. Lawrence was born the youngest of eleven children in 1781 at Burlington, New Jersey. Though the family started their young boy in the study of law, he was eventually entered into the Navy as a midshipman at the age of 17. By the age of 21, he was serving as a Lieutenant aboard ships in the Mediterranean when the United States was at war fighting the Barbary pirates. In 1804, he was Stephen Decatur's second in command when an expedition was sent to destroy the captured American ship, Philadelphia. The Americans made their way into the harbour at Tripoli and destroyed the Philadelphia. After his Mediterranean service, Lawrence was given the command of a succession of ships, including, the Vixen, Wasp and Argus. In 1810, he was promoted to the rank of Master Commandant and took command of the sloop of war Hornet and from the beginning of the War of 1812, Lawrence was very active in the Hornet. It will be remembered that Lawrence met up with HMS Peacock during February of 1813. The two ships met in a single duel off the northeast coast of South America. In the exchange the Peacock lost. Out of a crew of 110 on the Peacock, five were killed, including her captain, twenty-nine were wounded. "The Hornet received some trifling damage in her spars; and, out of 163 men and boys, had one man killed and two slightly wounded. "17 This meeting between Hornet and the Peacock was the last of five naval duels, three between frigates and two between sloops, all favorable in issue to the United States ..."18 Lawrence became an American hero. powder and shot. The captains had to, of necessity, restrict training in order to save for a real battle. 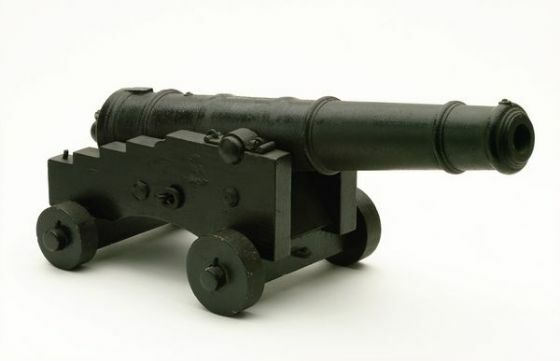 By 1813, this niggardliness was corrected by the admiralty, or Broke found a way to load up on powder and shot sufficient to keep his gun crews practising most everyday. In March of 1813, Shannon sailed from Halifax in company with another 38-gun frigate, the Tenedos. They were in search of "some of the far famed frigates" of the American navy. They were going to cruise Boston Bay. By the 2nd of April they were in a position to reconnoiter the harbour of Boston itself. It was known that the President was lying there, ready for sea. Sometime during the month of April, under the noses of the British, and with the assistance of foggy weather, the President slipped by and went to sea. There remained, however, in Boston, two other American frigates: the Constitution and the Chesapeake. The Constitution was undergoing "extensive alterations." However, the Chesapeake, an 18-pounder, 38-gun frigate, continued to lie in the harbour, apparently ready for sea. It was likely that this written message was not received before the Chesapeake let slip her lines and proceeded out of Boston harbour with the intention of putting an end to the effects of the Shannon's blockade of Boston. It was at about thirty minutes past noon, while the men were below at dinner, that Captain Broke was called on deck, and then he went himself to the masthead to see, to his joy, the Chesapeake, in a fair wind, making sail while proceeding out of Boston harbour. Behind her were a number of pleasure-boats carrying spectators eager to witness the whipping of a British frigate.25 It took a few hours for the ships to close.26 The Chesapeake steered a direct course for the Shannon coming up from behind on her right rear side, her starboard quarter. The Shannon came up into the wind somewhat which had the effect of slowing her down, so that her pursuer could catch up. The Shannon was at the ready. The Chesapeake had old glory flying from every pole, or sail mast: fore, main and mizzen; a proud and bright ship she was. The Chesapeake, likely because she had more sail up and because she was running more down on the wind, was moving through the water at a greater speed, or as sailors would say, "she had more way on." She was soon about to overlap the Shannon, who, in the meantime, was purposely slowing herself down by having less sail up and by keeping her bow more to the wind. Then the Chesapeake "luffed up," that is to say she too came more into the wind. She turned her bow to the right onto a course more parallel, and just behind and to the left of her adversary. The Chesapeake, however, still had more way on. At about the time the Chesapeake's bow was about to overlap the Shannon's stern, at a distance of about fifty yards, the Chesapeake's crew gave out three cheers, much the same as an enthusiastic playing team would give out just before the sound of the bell or horn that starts the game. The Shannon's gun crews were ready to go through the motions automatically even if they may become blind and deaf in the smoke and roar of the battle. In a moment, pounds and pounds of shot whistled across the water covering the short distance between the Shannon and the Chesapeake: pieces of flying iron some finding their mark, some not. And what were the marks: hull, gear, cordage, and men.